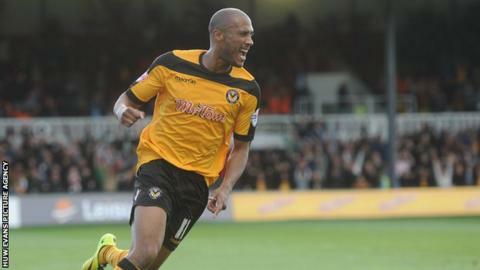 Newport County moved to within six points of the top of League Two with victory over Plymouth in front of 5,020 spectators at Rodney Parade. Chris Zebroski headed the Exiles in front against his former club, before County goalkeeper Jamie Stephens turned away Argyle defender Anthony O'Connor's close-range header. Mark Byrne doubled the Welsh side's advantage from Andy Sandell's corner. Reuben Reid hit the crossbar for the visitors, but County held on to win. The Exiles remain seventh in the table but have moved level on points with the sixth-placed Pilgrims, who they trail on goal difference. "In terms of energy, determination and effort I thought we were very good. "It wasn't a vintage game, but with the conditions I thought it was a well-fought game. "[The second goal] took the sting out of the game and disheartened Plymouth. "We were then able to play the last 10 minutes quite comfortably and see the game out." Match ends, Newport County 2, Plymouth Argyle 0. Second Half ends, Newport County 2, Plymouth Argyle 0. Attempt missed. Reuben Reid (Plymouth Argyle) right footed shot from the centre of the box is close, but misses to the right. Attempt saved. Reuben Reid (Plymouth Argyle) right footed shot from the right side of the box is saved in the bottom left corner. Reuben Reid (Plymouth Argyle) hits the bar with a right footed shot from the centre of the box. Aaron Bentley (Plymouth Argyle) wins a free kick in the defensive half. Corner, Plymouth Argyle. Conceded by Michael Flynn. Goal! Newport County 2, Plymouth Argyle 0. Mark Byrne (Newport County) right footed shot from the centre of the box to the centre of the goal. Assisted by Andy Sandell with a cross. Corner, Newport County. Conceded by Andy Kellett. Attempt missed. Chris Zebroski (Newport County) header from the centre of the box is too high. Corner, Newport County. Conceded by Carl McHugh. Attempt missed. Ismail Yakubu (Newport County) header from the centre of the box is just a bit too high. Chris Zebroski (Newport County) wins a free kick in the attacking half. Attempt missed. Reuben Reid (Plymouth Argyle) left footed shot from very close range is too high. Attempt missed. Kelvin Mellor (Plymouth Argyle) left footed shot from outside the box is close, but misses to the right. Lee Cox (Plymouth Argyle) wins a free kick on the left wing. Substitution, Plymouth Argyle. Marvin Morgan replaces Oliver Norburn. Attempt missed. Mark Byrne (Newport County) left footed shot from the left side of the box is just a bit too high. Attempt missed. Andy Sandell (Newport County) left footed shot from very close range is just a bit too high.